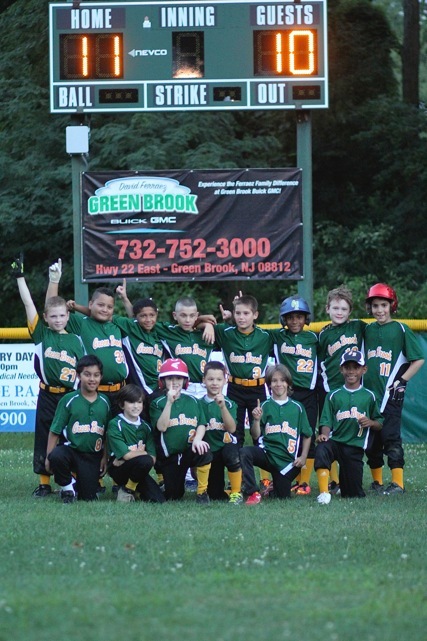 For the 2014 Summer season, Green Brook provided Baseball for 10 Travel teams across ages of 7U though 12U. The teams played throughout New Jersey. SPECIAL THANKS goes out to all KIDS that participated on these teams along with the COACHES who dedicated allot of time and efforts and our of course our parents. Summer Travel opportunities were offered for baseball at the 7U through 12U level. Summer all-star teams were formed for the same age groups by combining forces, in some instances, with sending district towns, to maintain competitiveness balance. GBLL Baseball ALL-Stars entered 9U, 10U, 11U and 12U into the NJ Little League District #17 Tournament. GB THUNDER 9U earned a 3rd place finish going 3 and 3. GB HEAT 10U competed and won Districts #17. The team went onto NJ Sectional Tournament and lost in the semi-finals as they finished 3rd. GB VIPERS 11U run at District #17 crown came to an end as they lost to the the Champions SH's. The team also finished in 3rd place and made it to the semi-finals of double-elimination. GB BULLETS 12U run at glory for District #17 crown came to an end with a 6 - 4 loss in the semi-finals. The team finished in 3rd place and made it to the semi-finals of double-elimination. GB LIGHTENING 8U finished with a .500 record and lost in the quarterfinals of the NPGL. GB THUNDER 9U won the playoffs of the NPGL age group with a come from behind vicory over Long Hill 11 to 10. NPGL Playoff League Champion with a 3 to 1 victory over Summit. Bound Brook Champion with a 5 to 4 come from behind victory over North Hunterdon. GB STORM 11U won the Regular Season Championship and was the runner-up in the Champiosnhip game. GB BULLETS 12U finished the NPGL with a loss in the quarerfinals. The GB HEAT are the champions of District #17. The District title is only the 5th time in the Green Brook Little League program that our team took this crown. The team went 7-0 in the District Tournament and continued its journey onto the NJ Sectional as they lost in the semi-finals. The teams other accomplishments throughout the year are Champions of the Toms River Tag-em Tournament and Clark Tournament. 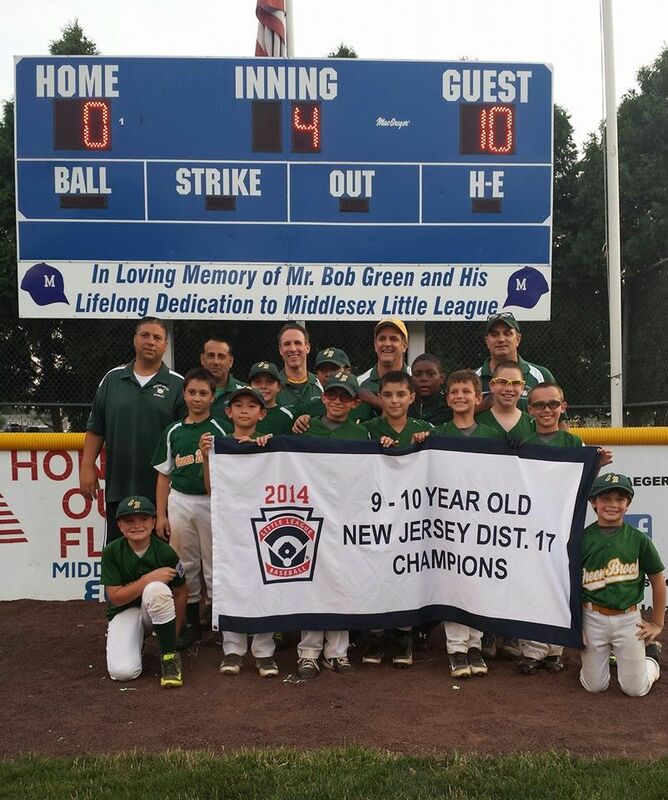 New Providence Green League has completed its season as Green Brook takes two titles and a Runner Up Crown. The 10U GB Bulldogs and the 9U GB Thunder captured the crowns this year with hard fought victories as the 11U GB Storm came up with a runner-up trophy. All the teams in the NPGL and Bridgewater League did a great job this Summer as the kids should be commended on a great season. Thanks again for supporting the teams throughout the Summer Season! 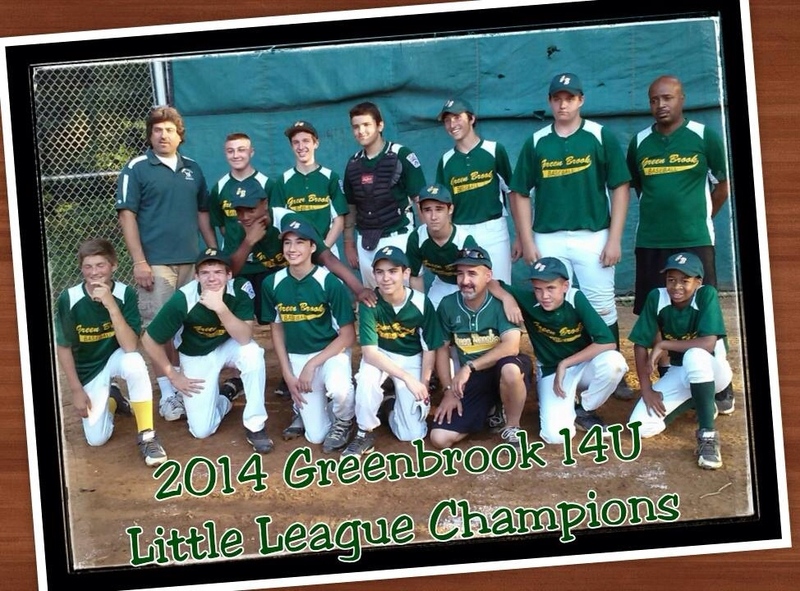 Congrats to the Green Brook 14U Team - League Champs!